Last month (May 2011). I went to the AIM Association with my school mate Mohamud. Our English teacher had talked in class about this association for interculturalism and youth mobility, which is located in an area of Rome called San Lorenzo, belonging to the III district where our branch school, via Da Procida, is situated. There we interviewed some guys who have founded and worked for that association. We wanted to find out something else about them, especially what kind of work they do with schools and what non-formal education is. We spoke to Erika Gerardini, the President of AIM, Federica Cicala, the manager for the Aim’s international area and with Christian, a guy who teaches at the drawing course. Erika told us that AIM means Agency for the intercultural mobility and it’s a youth association for the social promotion that works especially with the European dimension. She said that the association was born 3 years ago and was founded by 3 guys that had been educated in foreign countries in the international field and felt to have some skills to share. 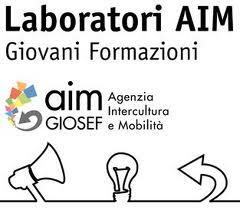 AIM is involved in non-formal education and works in the youth sector because they think that for young people it is really important to live experiences such as formation courses, workshops, foreign exchanges. They said that young people go with them on foreign exchanges and receive a recognized certification because sometimes they work with representatives of the commission of the Parliament, with the “Spazio Europa” or with the Ministry of Education in international affairs that let them attend workshops, and use facilities. They also work with the Lazio School Office (USR) in Lazio and with the Europe Office. Erika showed us their office and we also spoke to Christian, who was about to teach his drawing course. They said that during the year they had made many courses like a course to make web sites, a web radio’s laboratory, a music course, a non-formal English course etc. We felt that these guys are really motivated to carry out this project and this form of education and I think that schools have to establish links with these associations and do more projects with them! We have also shot minivideos of the interview, please see below.